↑ "On-line Picasso Project". Picasso.shsu.edu. http://picasso.shsu.edu/index.php?view=BioIndex&year=1881&quarter=4। আহৰণ কৰা হৈছে: 26 August 2010. ↑ "''The Guitar,'' MoMA". Moma.org. http://www.moma.org/collection/browse_results.php?criteria=O%3ATA%3AE%3Aex4620&page_number=3&template_id=1&sort_order=1। আহৰণ কৰা হৈছে: 2012-02-03. ↑ "Sculpture, Tate". Tate.org.uk. http://www.tate.org.uk/collections/glossary/definition.jsp?entryId=267। আহৰণ কৰা হৈছে: 2012-02-03. ↑ Adrian Searle (7 May 2002). "A momentous, tremendous exhibition". Guardian (UK). http://www.guardian.co.uk/culture/2002/may/07/artsfeatures। আহৰণ কৰা হৈছে: 13 February 2010. ↑ Moskowitz, Clara (8 February 2013). "Picasso's Genius Revealed: He Used Common House Paint", Live Science. Retrieved 9 February 2013. Becht-Jördens, Gereon; Wehmeier, Peter M. (2003). Picasso und die christliche Ikonographie: Mutterbeziehung und künstlerische Position. প্ৰকাশক Berlin: Dietrich Reimer Verlag. ISBN 9783496012726. http://books.google.com/books?id=vRzFAAAACAAJ। আহৰণ কৰা হৈছে: 8 October 2010. Berger, John (1989). The success and failure of Picasso. Pantheon Books. ISBN 9780679722724. http://books.google.com/books?id=5T1QAAAAMAAJ। আহৰণ কৰা হৈছে: 8 October 2010. Cirlot, Juan Eduardo (1972). Picasso, birth of a genius. প্ৰকাশক New York and Washington: Praeger. http://books.google.com/books?id=MvjVAAAAMAAJ। আহৰণ কৰা হৈছে: 8 October 2010. Cowling, Elizabeth; Mundy, Jennifer (1990). On classic ground: Picasso, Léger, de Chirico and the New Classicism, 1910–1930. প্ৰকাশক London: Tate Gallery. ISBN 9781854370433. http://books.google.com/books?id=M-_pAAAAMAAJ। আহৰণ কৰা হৈছে: 8 October 2010. Daix, Pierre (1994). 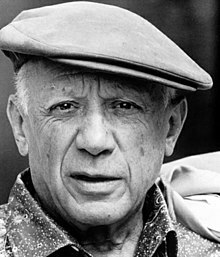 Picasso: life and art. Icon Editions. ISBN 9780064302012. http://books.google.com/books?id=hYymPwAACAAJ। আহৰণ কৰা হৈছে: 8 October 2010. FitzGerald, Michael C. (1996). Making modernism: Picasso and the creation of the market for twentieth-century art. প্ৰকাশক Berkeley: University of California Press. ISBN 9780520206533. http://books.google.com/books?id=fj2wtVCWkMoC। আহৰণ কৰা হৈছে: 8 October 2010. Granell, Eugenio Fernández (1981). Picasso's Guernica: the end of a Spanish era. প্ৰকাশক Ann Arbor, Mich.: UMI Research Press. ISBN 9780835712064. http://books.google.com/books?id=IlRQAAAAMAAJ। আহৰণ কৰা হৈছে: 8 October 2010. Krauss, Rosalind E. (1999). The Picasso papers. MIT Press. ISBN 9780262611428. http://books.google.com/books?id=pqXqbN4XUhcC। আহৰণ কৰা হৈছে: 8 October 2010. Mallén, Enrique (2003). The visual grammar of Pablo Picasso. প্ৰকাশক New York: Peter Lang. ISBN 9780820456928. http://books.google.com/books?id=EJAVAQAAIAAJ। আহৰণ কৰা হৈছে: 8 October 2010. Mallén, Enrique (2005). La sintaxis de la carne: Pablo Picasso y Marie-Thérèse Walter. প্ৰকাশক Santiago de Chile: Red Internacional del Libro. ISBN 9789562844550. http://books.google.com/books?id=EXoA4M1LnSkC। আহৰণ কৰা হৈছে: 8 October 2010. Mallén, Enrique (2009). A Concordance of Pablo Picasso's Spanish Writings. প্ৰকাশক New York: Edwin Mellen Press. ISBN 9780773447134. http://books.google.com/books?id=NvltPgAACAAJ। আহৰণ কৰা হৈছে: 8 October 2010. Mallén, Enrique (2010). A Concordance of Pablo Picasso's French Writings. প্ৰকাশক New York: Edwin Mellen Press. ISBN 9780773413252. http://www.mellenpress.com/mellenpress.cfm?bookid=8152&pc=9। আহৰণ কৰা হৈছে: 8 October 2010. Picasso, Olivier Widmaier (2004). Picasso: the real family story. Prestel. ISBN 9783791331492. http://books.google.com/books?id=HNVPAAAAMAAJ। আহৰণ কৰা হৈছে: 8 October 2010. Rubin, William (1981). Pablo Picasso: A Retrospective. Little Brown & Co. ISBN 9780316707039. http://books.google.com/books?id=8RRMPgAACAAJ। আহৰণ কৰা হৈছে: 8 October 2010. Wattenmaker, Richard J. (1993). Great French paintings from the Barnes Foundation: Impressionist, Post-impressionist, and Early Modern. প্ৰকাশক New York: Alfred A. Knopf. ISBN 9780679409632. http://books.google.com/books?id=wq_WAAAAMAAJ। আহৰণ কৰা হৈছে: 8 October 2010. Wertenbaker, Lael Tucker (1967). The world of Picasso (1881– ). Time-Life Books. http://books.google.com/books?id=vNbqAAAAMAAJ। আহৰণ কৰা হৈছে: 8 October 2010.